Determine the probability of debt recovery with an Asset Accumulation Report. Being a property manager brings with it the potential for serious risk, liability and consequences at a time when the scales of justice seem tipped in favor of the delinquent or "bad" tenants. 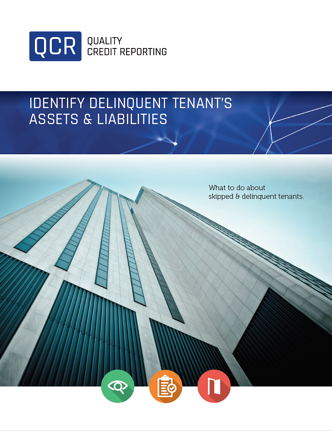 Once a tenant has gone delinquent, property managers must decide whether to proceed with a legal action and whether there is a strong probability of recovering the debt. Our Asset Accumulation Report will help. It is designed with your skipped and delinquent tenants in mind. It’s the most comprehensive report offered in today’s market and has been successful in assisting property management professionals to make the best decisions regarding the next course of action. This report will identify assets and liabilities and locate the tenant for service purposes. This report will help you make decisions at different stages, from the time the tenant first falls into arrears to the time the tenant makes the midnight move. The report also assists landlords who are dealing with a rent abatement situation or considering terminating a tenant's lease for unpaid rent.